Bottom: very slight Vee in nose, gradually becoming deepest behind fins. script and arrow head, blue/red/black. Nose -'Byrne' script and arrow head, blue/red/black. 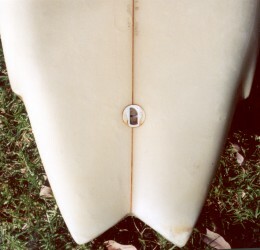 Tail : LB 5418 / 6'0'' x 21'', pencil over and under stringer. Red/Blue sprayed wing, nose to centre, with black pinline. Purchased Cash Convertors, Miranda Fair, NSW. May 1996. 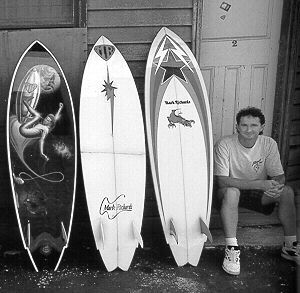 Laurie Byrne strated professional shaping at Jackson Surfboards, Carringbah. 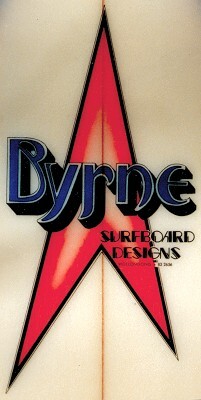 circa 1973 worked with the Byrne Brothers (no relation) at Skipp Surfboards, Wollongong, NSW. 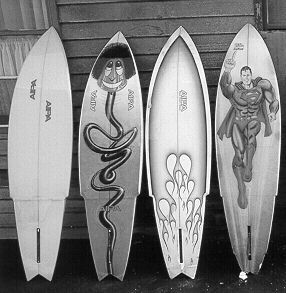 circa 1977 Subsequently joined the shapers stable at Byrne Surfboards, Fairy Meadow, NSW. 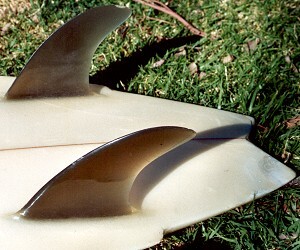 in Australia, a small following continued in the USA (Steve Lis ) with the development of the Fish. Legrope damage indicates possible pre rail saver use, tip damage to the tail is emdemic to this design.